My goal for Levi as a preschooler is to have a happy, fun time with learning, and to make sure he wants to learn. While my “plans” for organized activities were dashed upon the rocks, my hopes continued for Levi’s preschool learning to be fun. I will always have fond memories of itty bitty Tayt reading her Magic Treehouse chapter books her Kindergarten year just after she had turned 5. 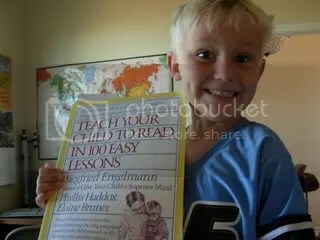 So we put the book away, and mentioned to Levi every so often as he came across things that he could benefit greatly from reading himself, that whenever he was ready we could continue his reading lessons. He began saying he would NEVER learn to read, didn’t want to do any sort of schoolwork, and didn’t even want me to read him stories. I just said , “Ok. 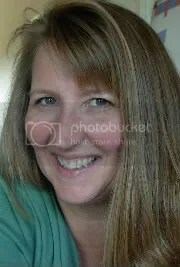 Let me know if and when you change your mind.” (While of course inside I was thinking “Oh No!! How terrible! I’m a terrible mom and teacher! 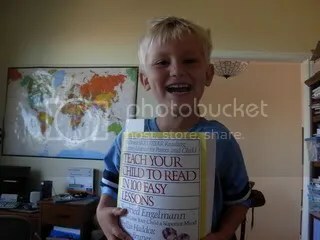 !” LOL) But then, I should mention that I was able to buy the full Kinderbach curriculum this past summer and he has been very much enjoying that. 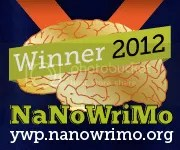 I’ll have to work on a post on that soon! I remember when I was using this book with Taylor, being skeptical at first that it would work. 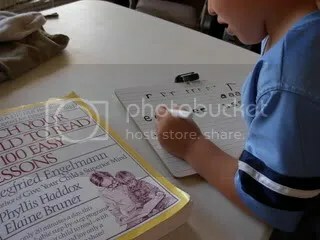 The teacher script is in red and suppose to be read word for word from the text. There are many helpful hints for correction, etc as the lessons progress. The lessons are very short and easy. I learned very quickly with Taylor that this book is extremely motivating and they learn to read their first real word in the third lesson, which is very encouraging to the child! I wasn’t sure with Levi being a boy, differences in motivation and learning styles, how he would do, but he has progressed just as well as Taylor did. I LOVE THIS BOOK! I’m just so thankful there is something out there this easy that works like a charm. Every time we do a lesson Levi tells me he wants to keep working until we finish the book. 🙂 We are currently on lesson 13, and have just read his first whole sentence. Since Taylor was only 3 1/2 when we were doing this book, she didn’t have the coordination to do the writing part, but Levi is enjoying doing the writing lessons as well. Categories: Gunn Ranch Academy, Preschool Happenings! | Permalink. For C week we started with our Itsy Bitsy C book. 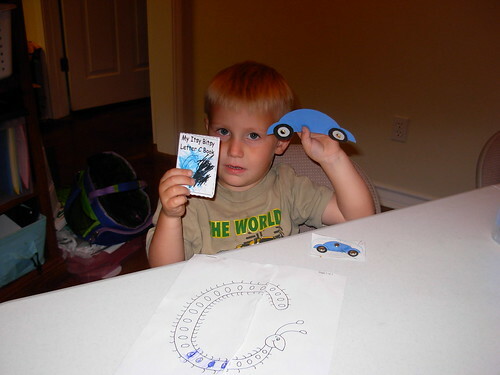 Levi put together a car with brads printed on cardstock and cut out from DLTK’s alphabuddies . 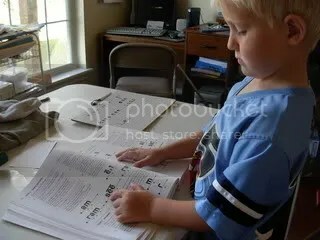 He colored and completed a few C sheets from ABC Teach. 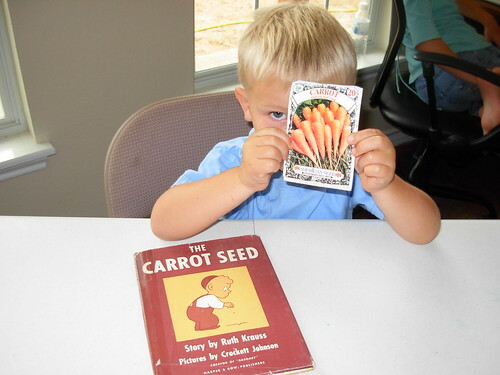 We revisited the Before Five in a Row book Carrot Seed and talked about the determination, care and faith it takes to grow seeds into plants to reep the vegetables or fruits they produce. We talked also about the tiny little mustard seed growing into a tree in Matthew 13: 31,32, which was the topic of children’s church the week we were studying C! We also referenced Matthew 17:20 "If you have the faith of a mustard seed…nothing will be impossible," discussing the little boys faith that the carrot seed would grow despite being told by his family it wouldn’t. Levi loves to sip my coffee. One morning of C week he said, "Hey Mom, coffee starts with C!" 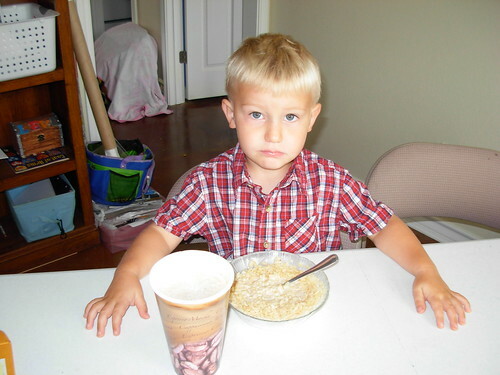 as he was eating his cereal. We discussed that coffee was hard c and cereal was actually soft c, so we decided coffee and cereal would be our "snack" for c.
We had a fun C week! Categories: Preschool Happenings! | Permalink. I’m catching up on letter B week since I just got photos loaded. 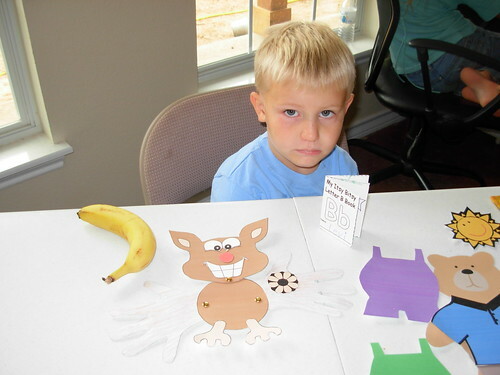 Levi loved making his Itsy Bitsy B book! Itsy Bitsy books are such a cute way to give the child something just their size to work on! We also ate a banana for our snack! We revisited Jesse Bear from our Before Five in a Row studies and I was able to cut out a bear I had printed with the Jesse Bear Fold-n-Learn I purchased last year from Five in a Row., along with several pieces of clothing that fits him. Tayt helped me stick velcro dots on everything so Levi could dress Jesse Bear. He had a ball with this (and I do believe Tayt enjoyed it as well!) 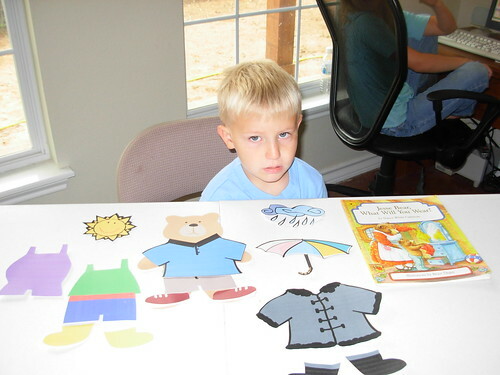 Homeschool Share is also a great place to find projects to go along with many of the BFIAR books, and they have lots of stuff to go along with Jesse Bear. I really wanted to make the whole lapbook they have, but not enough time this go around. Of course we sang the Leap Frog train’s "B says buh" all week too. We started our Preschool Time last week, beginning with Letter A. Levi was thrilled to have his own "schooltime" with Momma. We started by talking about the sounds letter A makes, then basic coloring sheets. 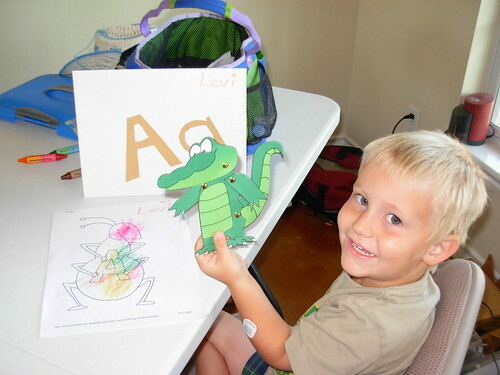 Levi then enjoyed gluing a capital A and lower case a made of sandpaper on a sheet and tracing them with his finger. Next, I had printed off A’s onto cardstock and punched holes in it for a lacing activity, which he loved. We then assembled an alligator, placing brads for head, arms and legs. 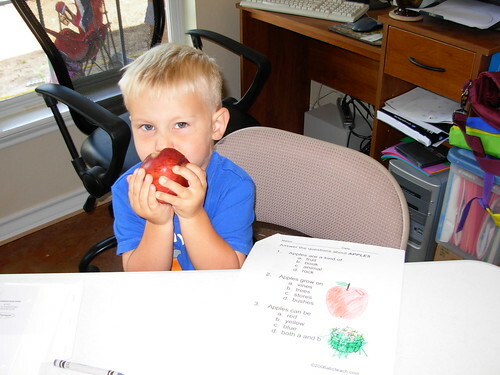 Later in the week we focused on apples, completing a basic reading comprehension worksheet, a couple of coloring activities, and eating red delicious apples. We sang the Leapfrog train’s theme song using the letter A all week: "A says A, A says A, every letter makes a sound, A says A , A says A, as the train is going round." While sisters’ became a bit tired of the tune by the end of the week, Levi loved singing it all week long. Sisters were thrilled to help think up words, songs and stories with the letter A as well as help Levi complete an art project on Friday by drawing in several pictures of things beginning with A on his tracing of an apple. Levi much enjoyed his A week! Thanks to Itsy Bitsy Books for so many great preschool sheets and projects, as well as ABC Teach whom I have access to for one month as a TOS Crew review. I had membership a few years back but since the girls are older have not renewed. I will certainly enjoy doing this review and renewing my membership with Preschool at the helm! Stay tuned for my ABC teach review! Levi is looking forward to B Week!